It’s almost April Fools’ Day, FunGoPlayers!! What pranks and tricks do you have up your sleeve? 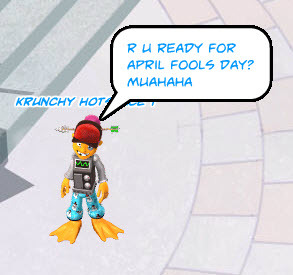 Come tell us about it at our April Fools’ Prank Party! Put on your silliest outfits and tell us about your craziest pranks ever! Why: 50 GoDough just for showing up! Plus, you’ll get to hear about all sorts of great prank ideas for April Fools! Tee Hee!! This is not a prank! For realz! Posted by fungoplay on March 30, 2012 in General.